There's a little over two weeks to go before I'm back on stage in Two Fat Men, one of two one-act plays being performed in Broadclyst and then being taken to the Exmouth One Act Play Festival in April. But today I'd like to divert your attention, for a second, from Broadclyst Theatre Group to Tiverton Dramatic Society, whom I last blogged about in December. Following the success of A Man For All Seasons and Jack and the Beanstalk, Tiverton Dramatic Society are returning to the New Hall in Tiverton next month with Stepping Out. Written by Richard Harris (no, not that one), the play is set in a North London tapdancing class, in which a motley bunch of middle-aged (mostly female) characters come together to put on a show. The play ran for nearly three years straight in the West End back in the mid-1980s, and was later turned into a film by Lewis Gilbert of Alfie fame. Tiverton Dramatic Society are a committed and highly professional bunch who always come through with the goods. I can vouch for this having been a part of A Man For All Seasons, but additionally the cast have all undergone tapdancing lessons from scratch for the last two months. It promises to be a fun and memorable night out, and unlike the show I'm appearing in, it's suitable for all the family. 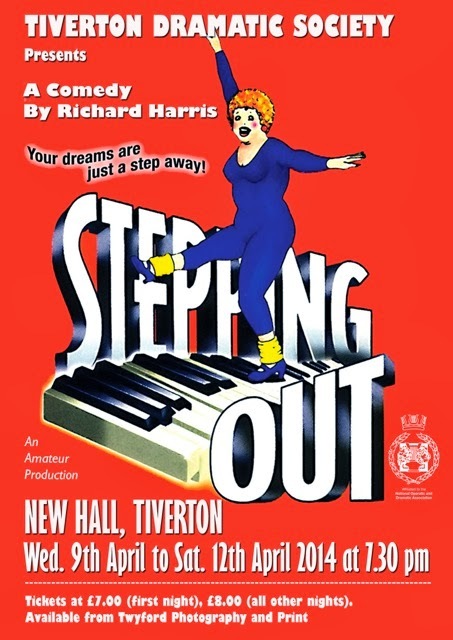 Stepping Out plays at the New Hall in Tiverton from Wednesday 9th to Saturday 12th April, with all performances starting at 7:30pm. Tickets are £7 for the opening night and £8 for all other nights, and are available from Twyford Photography in Tiverton. The very best of luck to all involved, and maybe see you there!